Oregon Inlet Boat Ramp - Located just off of NC Highway 12, behind the Oregon Inlet Fishing Center. Washington Baum Bridge - Located adjacent to the western side of the Washington Baum Bridge, in between Nags Head and Roanoke Island. Wanchese Boat Ramp - Located next to Moon Tillett's Fish Company and Fisherman's Wharf Restaurant, about a mile past the US 64 intersection. Kill Devil Hills Boat Ramp - Located on the soundside, next to the intersection of Bay Drive and Dock Street. Manteo Bowerstown Road Boat Ramp - Located at the end of Bowerstown Road, which is on the edge of Manteo, next to the US 64 intersection. Manteo Downtown Boat Ramp - Located just off of Budleigh Street, close to the historic Elizabeth II, which is docked in the downtown harbor. Kitty Hawk Boat Ramp - Located at the end of Bob Perry Road. Though Nags Head doesn't have any marinas within its town limits, it is within 10-30 minutes of some of the OBX's most popular regional marinas. Popular area marinas include the following. Oregon Inlet Fishing Center - This marina is the largest along the barrier island beaches, and features 45 fishing charter businesses, five public boat ramps, fuel, an extensive marina store, slips for rent, and easy access to the neighboring National Park Service campground. It's also the closest OBX marina to Oregon Inlet. Pirate's Cove Yacht Club - Located next to the extensive Pirate's Cove condo, duplex and home community, this marina features charter businesses, regular tournaments, dockage and slip rentals, fuel, and a marine store and on-site restaurant. Broad Creek Fishing Center - Found along the borders of the Wanchese Seafood Industrial Park in Wanchese, Broad Creek features a ship's store, marine supplies, charter businesses, fish cleaning services, fuel, and an extensive dry-stack storage facility. Thicket Lump Marina - This smaller Wanchese marina at the end of Thicket Lump Road boasts a number of charters, fish cleaning services, fuel, and a popular bait and tackle shop which features custom built rods. Manteo Waterfront Marina - This smaller marina features a nearby public boat ramp, as well as walking-distance access to downtown Manteo's acclaimed shopping and restaurants. Nags Head visitors will be close to two of the biggest hubs for fishing charter businesses on the Outer Banks - the Oregon Inlet Fishing Center and the marinas in the longstanding fishing town of Wanchese on Roanoke Island. Between the two regions, there are more than 100 charter businesses to choose from, which can offer both inshore fishing trips and offshore trips to the Gulf Stream. Both regions are minutes away from Oregon Inlet, which connects the sound with the Atlantic Ocean, and which is roughly 15 miles away from the Gulf Stream. Most charter trips are available in half-day or full-day increments, depending on the targeted Outer Banks fishing region, and offshore trips leave early at 6:00, 5:00, or even 4:00 in the morning. Fishing charters generally cost between $250 - $1200 per trip, depending on the length and destination of the fishing trip, and the party size. Parties of 1-6 anglers are welcome, though some vessels can accommodate larger groups. The open waters off of Nags Head, including the Albemarle Sound, Roanoke Sound, and the Atlantic Ocean are patrolled by the US Coast Guard as well as the Marine Patrol of the North Carolina Division of Marine Fisheries. Boaters who need assistance can also contact SEATOW / Boat U.S. service, which serves the Outer Banks area. All children under the age of 13 are required to wear an approved personal floatation device when a vessel is moving, according to North Carolina state law. Personal watercrafts must be operated by mariners who are 14 and older, according to North Carolina state law. Personal watercrafts can be operated within 300 feet of the shoreline or fishing pier in the town of Nags Head. 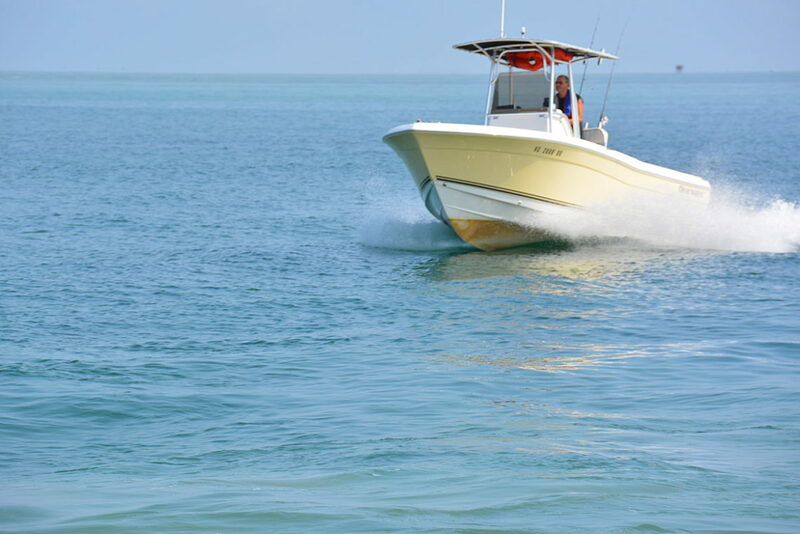 When launching from a public or private boat ramp, mariners must go straight in and straight out, and not exceed 5 miles per hour until well outside the town limits. Motorized vessels cannot be launched from the Jockey's Ridge State Park or the Danube Street Albemarle Sound access. Boaters and personalized watercraft operators close to Oregon Inlet must heed all area closures administered by the National Park Service, which may include the waters adjacent to the beaches. Signs will be posted when these waters are closed to the public. For a complete overview of the North Carolina Wildlife Resource Commissions' regulations, which includes regulations for vessels, operators, and local waters, review their online handbook at http://www.ncwildlife.org/Portals/0/Boating/documents/VOG.pdf.